The Hunger Games: Mockingjay Part 1 is the first cinematic half of the third and final installment in the Hunger Games franchise, based on the best-selling novels by Suzanne Collins. 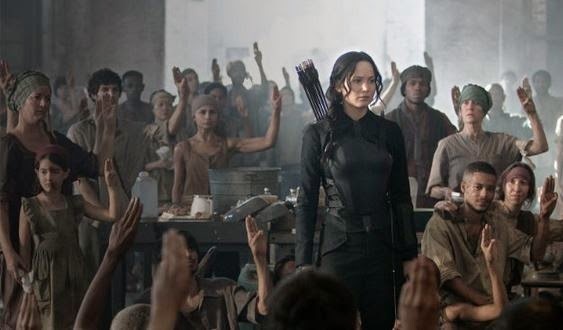 Francis Lawrence, who directed the excellent second film, Catching Fire, returns to direct, and the story continues to follow Katniss Everdeen (Jennifer Lawrence) as she becomes a reluctant hero and symbol of hope for Panem after escaping the Third Quarter Quell Hunger Games. After seemingly destroying the Games for good, Katniss finds herself recovering in District 13, with her mother and sister and leaders of the Panem rebellion. District 13 is led by President Alma Coin (Julianne Moore), who along with her allies including Plutarch Heavensbee (Philip Seymour Hoffman), Katniss’ mentor Haymitch Abernathy (Woody Harrelson) and publicity representative Effie Trinket (Elizabeth Banks), attempts to convince Katniss to become the beacon of hope for the rebellion. She is distraught having learned that her fellow Games competitor Peeta (Josh Hutcherson) has been captured by the Capitol’s tyrannical President Snow (Donald Sutherland), and by the horrors she discovers have been afflicted on District 12 and beyond. Her reactions to the atrocities and military-escorted contact with enemy forces are then broadcast around Panem, including the Capitol, who retaliates with their own propaganda broadcast in an attempt to intimidate Katniss and quash the strengthening rebellion.